Whether you drive a little or a lot, these gas credit cards are great for anyone who finds themselves at the fuel pump. Get gas, get rewarded - it's that simple. Each of these cards offer varying rewards on other categories as well. We analyzed 390 credit card offers with gas rewards to get to our top 10 recommendations. Review the best gas rewards credit card offers from our partners below and apply for the card that best fits you. See the best gas credit card offers from our partners below. 1X Earn 1X Points on All Other Purchases. 5% 5% cash back on your first $2,000 in eligible net purchases each quarter on the combined two categories you choose. 2% 2% cash back on your choice of one everyday category, like gas stations or grocery stores. 1% 1% cash back on all other eligible net purchases. 2% Earn 2% cash back at gas stations and restaurants on up to $1,000 in combined purchases each quarter. Earn 2% cash back at gas stations and restaurants on up to $1,000 in combined purchases each quarter. Plus, earn unlimited 1% cash back on all other purchases – automatically. Receive Free Social Security number alerts — Discover will monitor thousands of risky websites when you sign up. Gas credit cards provide special rewards like cash back, points, and rebates for purchasing gas. If you’re interested in a gas credit card, note that there are several types, each with a unique set of benefits and conditions. Beyond saving money at the pump, the best gas credit cards can help you build credit, lower your grocery bill, and start collecting valuable points you can use toward other things like travel rewards. How do gas credit cards work? How much can you save with a gas credit card? With many different types of gas cards, you’re in a position to find a card tailored to your needs. Whether you’re a small business owner who does a lot of local traveling or a brand-loyal consumer looking for a gas credit card, there’s an option for you. Read on before making a decision! *Up to $2,500 on combined purchases each quarter. Pros: The Blue Cash Preferred offers the best of its competitors, with a $200 welcome bonus after $1,000 spent within the first 3 months; 6% back at U.S. supermarkets (up to $6,000 a year, then 1%); and 3% back at U.S. gas stations and select U.S. department stores. No other card offers as high of earnings at U.S. supermarkets, and the earnings on U.S. gas stations are more than competitive. Cons: This card's annual fee is hefty, at $95, and it isn't waived the first year, meaning you don't get those initial savings with the waived fee. Pros: Looking for a card that rewards for all manner of travel? This is a great choice, with rewards in not only flights and hotels, but also homestays and rideshares. Earn 3X points for gas, rideshares and transit; eating out and ordering in; and travel, including flights, hotels, homestays and car rentals. You can also earn 30,000 points after a $3,000 spend within the first 3 months of card membership. Cons: If you're looking for rewards on groceries, look for a different card, such as the Bank of America Cash Rewards or the Blue Cash Everyday. Pros: The Blue Cash Everyday offers great rewards on gas and groceries without an annual fee, making it competitive with the Bank of America Cash Rewards. Earn 3% back for up to $6,000 a year (then 1% back) at U.S. supermarkets; 2% back at U.S. gas stations and select U.S. department stores; and get a $150 welcome bonus after a $1,000 spend within the first 3 months of card membership. There's also a 0% intro APR offer of 15 months on purchases and balance transfers – then the regular rate becomes 15.24% - 26.24% variable. Cons: If you don't mind an annual fee, this card can be beat by its big brother, the Blue Cash Preferred, which offers 6% back on U.S. supermarkets for up to $6,000 a year. Pros: There are myriad ways to earn with this card. Not only do you get a 15,000-point sign-up bonus after a $1,000 spend within the first 3 months, your rewards are always rounded up to the nearest 10 points and you can earn 10% back on redemptions up to 100,000 points. Finally, earn 2X points at supermarkets and gas stations up to $6,000 spend each year and 1X thereafter. Cons: There are a couple of fees that might scare you away: The balance transfer fee is 3% or $5, whichever is greater, and there is a foreign transaction fee of 3%. Pros: In addition to 3% on gas—if you choose it as your 3% category—this card rewards you with 2% back on grocery store and wholesale club purchases for a combined $2,500 each quarter, then 1%. By default, the 3% cash back category is gas when you receive the card, but you can change it once a month to any one of 6 categories that also include travel, dining, and online shopping, for example. There's also the $200 sign-up bonus after a $1,000 spend within the first 90 days of card membership. The Bank of America Cash Rewards' everyday rewards have oomph, and the no annual fee helps things along. Cons: Gas and travel are considered two separate categories, so you can't earn 3% cash back on both at the same time. Pros: The U.S. Bank Cash+ offers the best of both worlds – the 5% back on select categories, rivaling the rotating category cards, such as the Discover it Cash Back, as well as the 2% back of the Blue Cash Everyday on gas. Earn 5% back on 2 select categories (up to $2,000 a quarter) and 2% back on 1 everyday category, such as gas stations or grocery stores. There's also a $150 sign-up bonus after your first $500 spent within the first 90 days of opening your account. Cons: There's a fair amount of organizing with this card – you'll need to sign up for which categories you want and keep track of them. Pros: The Wells Fargo Cash Wise offers simplicity without sacrificing rewards. Upon receiving, cardholders are eligible for a $200 sign-up bonus for $1,000 worth of spend within the first 3 months. Additionally, the card offers a flat rewards rate of 1.5% (including gas purchases). And the Wells Fargo Cash Wise Visa is all kinds of fun with an impressive 1.8% for mobile purchases made within the first year. There's also no annual fee. Cons: You can do better on rewards if you are willing to sign up for rotating categories, such as with the Chase Freedom or the Discover it Cash Back. Pros: Earn 2% back at gas stations and restaurants (up to $1,000 in combined purchases quarterly, then 1%), plus double your cash back at the end of your first year of card membership. That means if you spend $200 a month on gas and dining out, that comes to $48 for the year, plus another $48 at year end. Cons: If you think you might be tempted to overspend with this starter card because of the rewards, this may not be the best choice for you. Pros: There are no rotating categories with this card, freeing you up to spend in any way you choose. Although there is no sign-up bonus, you can earn 1.5% back on all purchases. The QuicksilverOne accepts consumers with fair credit, which is handy if you are trying to improve your credit, and you also want to practice using rewards. Cons: This cash back card has the unusual feature of an annual fee ($39), which lowers your overall rewards. That means to benefit from the 1.5% back, you'll need to spend at least $2,700 each year to break even. Pros: Designed with students in mind, this card offers 2% back at gas stations and restaurants on up to $1,000 in combined purchases per quarter. On all other purchases, you get unlimited 1% cash back. There's no annual fee, and you get rewards for good grades in the form of a $20 statement credit for each school year your GPA is 3.0 or higher for up to the next 5 years. Also, consumers with no credit history are accepted. Cons: While ideal for a consumer just starting out, this is a card you will outgrow rather quickly. Gas credit cards offer special rewards for purchases on gas; they can be categorized as either rewards cards or rebate cards. 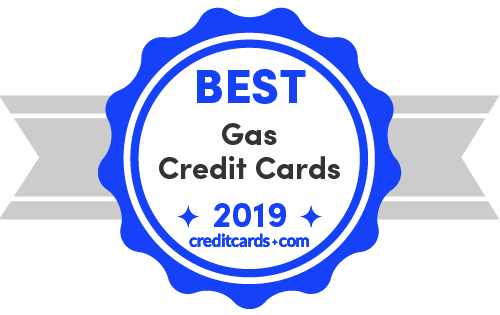 The best gas rewards cards offer cash back (usually 1-3%) or points on gas, as well as on purchases in other categories. Gas rebate cards offer cents off for every gallon of gas purchased. General cash back cards with rewards on gas purchases. Gas rebate cards that are co-branded with a retailer like BP and network like Visa or Mastercard. Gas rebate cards that are specific to one retailer like Shell or Chevron and not within a network. The key to maximizing your savings is to find the card that most closely aligns with your spending habits. As a rule of thumb, gas rebate cards are best for people who are brand-loyal. If you buy gas at many different retailers, a gas rewards card is usually the better choice. Most cashback and rewards credit cards offer incentives for spending on gas, but also offer rewards on other types of purchases. For this reason, top cashback cards like the Blue Cash Everyday® Card from American Express are among some of the best gas and grocery credit cards. General cashback and rewards cards are a great tool for simplifying and magnifying your savings. Use these and you won’t have to worry about leaving savings at the pump or in line at the grocery store. Branded gas credit cards like the Shell Drive for Five® and BP Visa® Credit Card are usually rebate cards. With these, you’ll save anywhere from 5 cents to 25 cents per gallon of gas you buy at that particular retailer. However, branded cards don’t offer rewards on purchases at other gas retailers. Not all gas rebate cards are part of a network like Visa or Mastercard. Shell’s Drive for Five credit card is a non-network rebate card that will earn you five cents off per gallon at Shell, but it can’t be used for purchases anywhere else. Gas cards that are within a network usually feature Visa, Mastercard, American Express, or Discover logos. Gas credit cards in a network offer extra rewards, but still exclude purchases at other gas retailers. If you have a BP Visa® Credit Card, you’ll earn five cents off per gallon for every $100 spent on non-gas purchases where Visa credit cards are accepted, but no rewards on purchases at non-BP gas stations. Rebates expire, usually after 12 months. Because of this, it’s difficult to accrue enough rewards to redeem them for a large amount of “free” gas. Essentially, with a branded gas rebate card, you can expect some decent savings on on-brand gas purchases, but negligible awards on most other things. You drive a lot or have a long commute. Whether you go with a traditional rewards card or opt for a gas rebate card, if you drive often, a gas credit card will help you save. If you’re already spending an hour at least on the road per day, why not get rewarded for it? Start using those commuter miles to your advantage with a gas card. You have good/excellent credit and want to expand your rewards. There are points to be had and cash back to be earned for people who are good candidates for cards like the Bank of America® Cash Rewards® Credit Card. If you aren’t already saving on gas in some way, you can certainly start with a cashback credit card. You don’t have a stellar credit score. The high APRs on most gas cards make carrying a balance a bad idea, but if you pay off your balance every month, using a gas card will improve your credit. Unlike other types of rewards cards, most gas cards will approve your application instantly, even with poor credit. You’re planning a road trip. Although most gas credit cards don’t offer 0% introductory APR, a lot of them provide high rebates for the first few months. The Phillips 66 Drive Savvy® Rewards Credit Card knocks fifty cents off per gallon purchased for the first 30 days—which adds up to huge savings on a summer road trip. Introductory rebate offers pay off no matter how much you drive, but when planning a major road trip, the savings quickly add up. The bottom line is: if you drive a lot, you’re gas brand-loyal, and your credit is average or limited, a gas credit card may be a good option for you. If you’re not brand-loyal, there are still many other credit cards for people with fair credit to choose from. You can take advantage of gas cards with introductory rebate offers to experience significant savings, especially in the first couple months. Let’s examine a real example to find out how much money you can potentially save. Let's say you travel 25 miles a day to work 5 days a week and 100 miles on the weekends, which means you travel 225 miles a week or 11,700 miles a year. The average cost of gas in the U.S. on April 1, 2019, according to AAA, is $2.69, and if you are driving a 2017 Jeep Wrangler with an EPA combined city/highway fuel efficiency of 18 mpg, you will spend about $3.70 on gas a day or about $33.63 for the week. Earn 50 cents per gallon the first 30 days – that's $26.70 the first month. Earn 10 cents per gallon from day 31 to day 90 – that's $10.71 for 60 days. Earn 5 cents per gallon after the first 90 days – that's $24.48 the next 275 days. That's $61.89 saved for the first year, and you'll save $32.49 the second year. You're traveling from Dana Point, CA to Leggett, CA (653 miles, according to the Travel Channel). You’re driving a 2017 Jeep Wrangler with an EPA combined city/highway fuel efficiency of 18 mpg. The average cost of gas in California is $3.62 per gallon (as of April 1, 2019, according to AAA). If you were to pay for gas without the use of a gas card, you’d spend $262.65 on fuel round-trip. With the use of a Drive Savvy Rewards Credit Card from gas retailer 76, you can take advantage of 50 cents off per gallon offer for the first 30 days. With this card, you’ll spend $226.38 in total. That’s a savings of $36 on one road trip alone. If you’re considering a gas credit card, consider the intro offers in the context of your own gas budget. For many people, the rewards are lucrative and a smart way to save money. When you're choosing between 2 gas credit cards, there are intro bonuses, ongoing rewards and annual fees to consider. Here, we compare a gas rewards card with a gas rebate card, the Blue Cash Preferred and the Exxon/Mobil Smart Card. Heads up that gas rebate cards offer cents off per gallon, which can result in bigger savings when the cost of gas is low. On the other hand, when gas prices are high, a gas rewards card that offers a percentage cash back may be better. With the average cost of gas at $2.69 and using the Exxon/Mobile Smart Card (6 cents off per gallon) to purchase 15 gallons of gas, that results in a savings of 90 cents. Using the Blue Cash Preferred Card from American Express (3% cash back at U.S. gas stations) to purchase the same amount of gas results in a savings of 1.21 cents. Often, but not always, annual fees can be a signal of superior rewards. In the case of the Blue Cash Preferred, there's a $95 annual fee, and that's in exchange for a superior welcome bonus and ongoing rewards. Meanwhile, the Smart Card offers no annual fee. While the Smart Card has no sign-up bonus, it has a boosted rewards offer of 12 cents on every gallon of Synergy fuel the first 2 months and 50 cents on every gallon the first 2 months when you apply through the Speedpass+ app. Meanwhile, the Blue Cash Preferred offers a $200 welcome bonus after the first $1,000 spent the first 3 months of card membership. While the Smart Card rewards for fuel (6 cents on each gallon), the Blue Cash Preferred rewards for much more, including 6% back at U.S. supermarkets (up to $6,000 a year) and 3% back at U.S. gas stations and select U.S. department stores. As you can see, the rewards add up with the Blue Cash Preferred. The average APR on a gas credit card is very high, 23.61%, per the 2018 CreditCards.com gas card survey. Most gas cards don’t offer a 0% introductory APR either, so if you’re planning on using one, pay off your balance every month to avoid paying interest. As you will see, the Blue Cash Preferred, even with its annual fee, offers excellent rewards the first year, compared to the Smart Card. Even after the first year, the Blue Cash Preferred comes out ahead with $310 for the year compared to $88.20 with the Smart Card. In fact, we found that general-purpose gas rewards cards time and again have greater value. Griffin Miller is a personal finance writer at Bankrate, specializing in credit cards. He frequently contributes research, guides, and advice to CreditCards.com. You can reach Griffin at editors@creditcards.com.